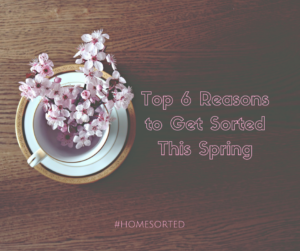 Top 6 Reasons to Get Sorted This Spring - Home Sorted! With spring sorting season just around the corner, there has never been a better time to get sorted. If you’re feeling a little bit sceptical about the whole process, you’re in the right place. Keep reading as we explain our top 6 reasons to get sorted this spring! This is a big one. Sure, it may take a bit of time to thoroughly sort your home. BUT you will be saving yourself oodles of time in the long run. Think about the last time you couldn’t find an item. Whether it’s a certain work top, or a pair of your kid’s shoes. With a well organised and decluttered home, time spent searching for items is minimised leaving you free to focus on the things that matter most to you. Not only do you save time, but you can also save money. Unnecessary spending or purchases often happen when you’re not thoroughly aware of what you already own. A great by-product of getting home sorted is a clear reduction in stress! Say what? You heard right. When we organise our homes and remove excess clutter we also remove stress and begin to feel calmer in our everyday life. We don’t preach the home sorted = life sorted mantra for nothing! Along with a reduction in stress, your new-found time will give you a chance to increase the activities that truly relax you. Whether this is reading a new book or binge watching a series on Netflix, the choice is yours. Like the above point, you can also use this time to nurture relationships with friends and family! 6. It’s easier to maintain a well sorted home than to get sorted! Did you know that it’s far easier to maintain a sorted home than it is to get sorted in the first place? Sure, we know that the initial sorting phase may take some time, but it will be more than worth it in the long run. If you do one thing today, trust us about this!